This option allows a project to be deleted, along with the song it contains and all patterns it contains. The currently open project cannot be deleted, only unopened projects can be deleted. A list displays all the projects that can be deleted. Selecting Close returns to the Project Options. 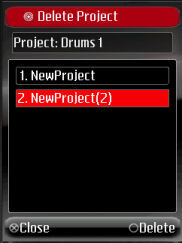 In this example, "NewProject(2)" is highlighted, and Delete selected. The application asks for confirmation. Selecting No does not delete the project. Selecting Yes deletes the project.